There has been a three-week break since the last Asian race, giving teams plenty of time to develop new upgrades, and traditionally where many teams introduce new improvements to hardware and increasingly, software. This weekend the F1 circus moves to Barcelona for the Spanish Grand Prix to kick off the European leg of the 2014 season. 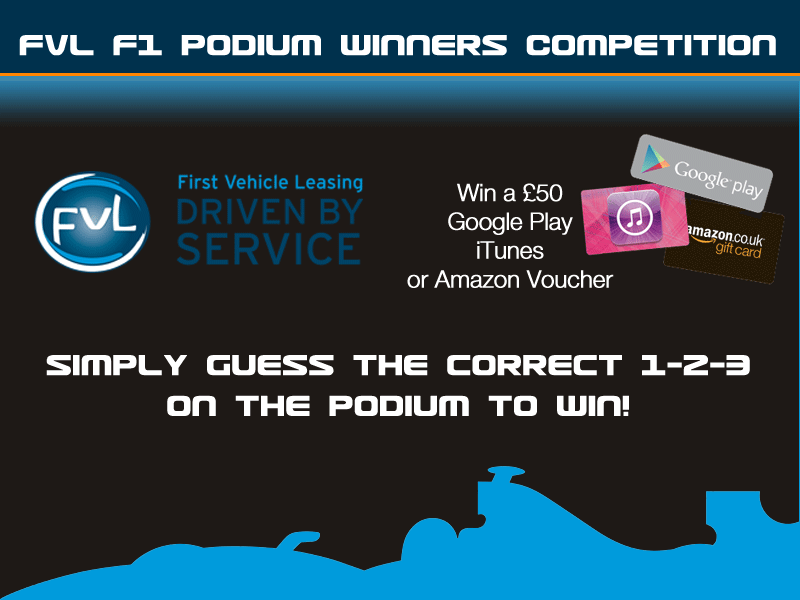 As with every race this season, you can win £50 of Vouchers by guessing the podium 1-2-3 in our FVL F1 Podium Winners Competition. Mercedes have enjoyed an advantage of around six-tenths of a second a lap over their principal rivals Ferrari and Red Bull in terms of raw speed, though their race pace has been even better. They are determined to pull further ahead here. Meanwhile, Ferrari hope to keep building on the momentum they got going in China, where Fernando Alonso scored the Italian team’s first 2014 podium after the disappointment of Bahrain. The Spaniard remains cautious ahead of his home race, however. “The car was under-performing in many areas – it was not just one problem,” he said after finishing third in Shanghai. “We need to be more efficient, have better aerodynamics, better traction, better power. We lacked some big performance in the first races. In China it was nothing really big in one area, just small steps here, small steps there – better power delivery, better software, putting everything in place, all the settings, and giving a little bit more aero efficiency and a little bit more power. Red Bull arrive full of optimism as power unit supplier Renault expect a big upturn in performance thanks to changes to their Turbo V6 power plant. In particular, boss Christian Horner wants to see significantly improved straightline speed. He is aiming for a victory to kickstart the team’s title aspirations. 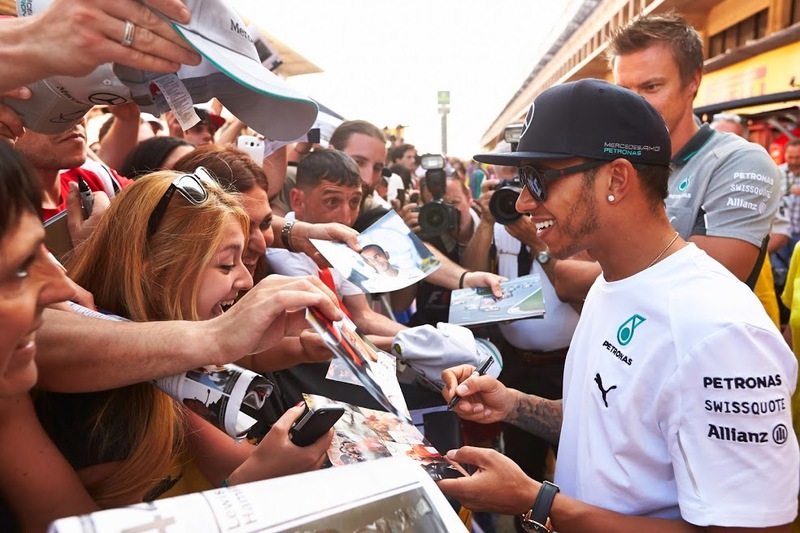 “We’ve got to beat Mercedes here if we’re going to make a championship of it,” he admits. “We’ve got to take the fight to them. We’re going to give it everything. I believe we can take the fight to them, we just can’t concede too much more ground. Pirelli are bringing their two hardest compounds for what they describe as a ‘high-energy’ circuit: the hard and medium compounds. The familiarity of the Catalan track makes it a good place to introduce updates designed primarily to enhance downforce, and that in its own way affects tyre performance as it adds to the demands placed upon them. Further back, while all of the smaller teams will similarly have updates, Sauber have revised engine software, hoping to squeeze more out of the Ferrari V6, and a lightweight version of the C33 chassis that is a massive 15 kg lighter than its predecessor. Add to that a revised aero package, and you can see why the Swiss team are hopeful of getting into the midfield scrap. Weather conditions are forecast to be dry sunshine, around the 21C mark. See more race preview quotes from the teams and drivers here. During first practice, Mercedes unsurprisingly headed the times in early running, and there was a setback for Red Bull with Sebastian Vettel’s car being retired with an electrical fault very early on, requiring a quick squirt from the fire extinguisher. There was an unusual problem for Sergio Perez as his left wing mirror became detached, forcing him to struggle back to the pits one-handed as he struggled to hold on to keep the wayward mirror from striking him. Ricciardo’s Red Bull also suffered a similar ‘bits falling off’ issue, with a aero fin alongside the cockpit coming loose, forcing him to hold onto it to avoid it flying off, but this did not prevent him from placing his car in 3rd place overall. Guido van der Garde had a dramatic near-miss after his Caterham’s brakes failed completely going into Turn 1 at the end of the finishing straight, narrowly avoiding hitting the barriers as he struggled to control the car. However, there was good news for McLaren later in the session as Jenson Button went fastest, with his reports of understeer being relayed back from his engineer as “Good news”, as the car was “probably doing what we expected”. So there could be competitive pace in the McLaren with their upgrades working to plan – and the car also put in 26 laps in the session, with team-mate Magnussen putting in more laps at 27, but Maldonado topping the mileage charts at 34 laps. But then, almost inevitably, Hamilton took the fastest lap towards the end of the session, with an improvement of over 0.8 of a second on Button’s time. 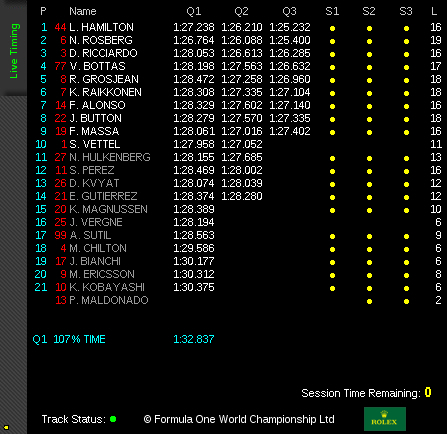 Team-mate Rosberg suffered from mechanical problems, but still managed the 5th fastest lap time. Ferrari performed respectably, placing Alonso and Raikkonen 4th and 6th respectively, with the Spaniard likely to once again out-perform the car in front of his home crowd. 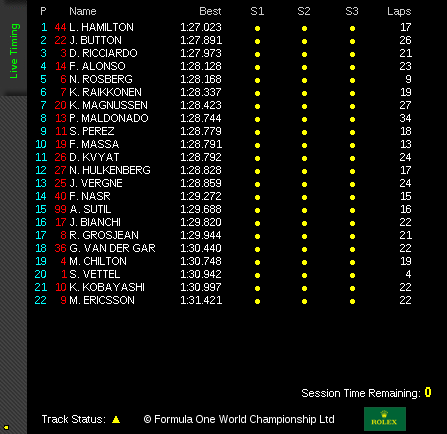 No surprises for the 1-2, but impressive work by Williams’ Bottas, and by Roman Grosjean and a respectable top 10 placing for Jenson Button. Barcelona is a circuit where winning from pole is highly likely given the difficulties of overtaking here. So our money is on Hamilton. But anything can happen, and the Mercedes may be more harsh on tyres during the race, giving Red Bull and perhaps even Williams a chance to shine. Add your prediction with a comment below… good luck! As with every Formula 1 race this year, we are holding the FVL F1 Podium Winners Competition – just guess the correct 1-2-3 on the podium by entering your prediction at least an hour before the race starts, to win. The prize for a correct entry is the winner’s choice of a £50 value of either an iTunes Gift Card, a Google Play Gift Card or an Amazon Gift Card. A winner will be drawn at random if more than one entrant correctly posts the winning 1-2-3. Full Competition Terms and Conditions are here but in essence, you have to be UK resident, and aged 18+. We won’t add you to any mailing lists, or share your details. Please use the hashtags #f1fvl and #myfvl if you share your entry socially, and do join FVL socially online. Good luck! This entry was posted in Formula 1, News and Views, Sports Car and tagged #f1fvl, F1, formula 1, formula one, Formula One Driver, myfvl by David Petherick. Bookmark the permalink. No winners this time around. See you in Monaco!